SPENGA is a one-stop-shop to train every aspect of your fitness. It's simple, its uncomplicated, and its exciting! There are ultimately three components of fitnes being cardio, strength, and flexibility. 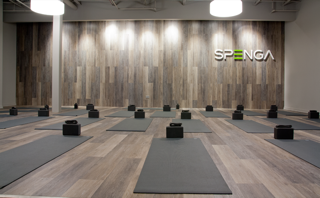 SPENGA is the first studio of its kind, to put equal focus on all 3 components in one 60-minute workout, through a combination of spin, strength and yoga. The Falls Shopping Complex at the corner of Queen Creek and Alma School. Same complex as Stone and Vine, Starbucks, Farmboy.